In the race for promotion, effectively a third of the distance has already been safely negotiated. And there Pompey are, second spot, one defeat and with no over-reliance of any particular individual. Unquestionably encouraging progress delivered by the man charged with achieving promotion in his debut season at the helm. Not perfect, certainly room for improvement, however this Blues side continues to be well up with the pace to charge out of League Two. Of course the Fratton Park form remains a concern, the applying of a handbrake to bludgeon the speed of delivery. Saturday’s visit of Mansfield followed a pattern familiar during the reign of Paul Cook on home turf, resulting in a common outcome. Dominant possession, a lack of cutting edge, a spoiling draw, the odd boo yet generic frustration among the Fratton faithful. Admittedly there has been the sole defeat to this point, one loss in the opening 15 fixtures deserving recognition regardless. However, a haul of two wins from eight Fratton matches in the league continues to hinder the Blues’ aspirations of a smooth passage out of the bottom division. An obvious weakness, granted, and unfortunately regularly occurring under the gaze of more than 15,000 Pompey fans. Yet it is far from applying the wheel clamps to this Cook side in the push up the table. After all, Pompey remain in second place, four points adrift of leaders Plymouth Argyle, a team they beat at Home Park in August. Nothing wrong for the clamour of footballing perfection, of course. Neither should lofty expectations be criticised. Yet the transition from League Two strugglers to promotion candidates within a matter of months was realistically never going to be smooth. And so Cook finds himself underachieving at home, while on the flip side defying convention by proving a remarkable success on his travels. His issue is only the minority of Blues followers have been present to savour such away-day outings and the subsequent five triumphs. Meanwhile at Fratton Park, Mansfield have now joined the lengthening queue of sides departing with the minimum of a point having achieved a shut-out. Adam Murray’s side entered the fixture in fifth place, after winning their previous three matches away from Field Mill. They failed to even test the recalled Brian Murphy, nonetheless would have been delighted to have succeeded in avoiding defeat. Just like the others. That’s now Morecambe, Accrington, Yeovil, Stevenage and Mansfield. Throw in Exeter, who won last month, and that’s six teams who have frustrated. Home victories over Dagenham & Redbridge and Barnet hardly represent a satisfactory balancing of the scales in the eyes of all who follow the club’s progress. On Saturday, there were a mere two meaningful threats on veteran keeper Brian Jensen, both coming in the second half. The first was a fierce angled shot struck by the ever-excellent Ben Davies, clawed over the bar by the Stags’ stopper. Then, in the 81st minute, substitute Conor Chaplin picked himself up off the floor to prod a close-range effort goalwards only for it to take a nick wide. That was the summary of Pompey’s finest efforts, an unfortunately brief highlights package which spanned 90 minutes plus five minutes added on at the end. In between there was plenty of possession for the hosts, while the opening 25 minutes were bright and progressive as Mansfield retreated deep to hold off at arm’s length. Cook had brought in the fit-again Murphy for Aaron McCarey, who had returned to parent club Wolves upon the culmination of his loan spell, while Danny Hollands was preferred to Adam Barton. Instead Barton, without injury, was not even included in the 18-man squad as he watched from the South stand with other team-mates not selected. Gary Roberts’ continued ankle problem opened the door for Kal Naismith to try to impress again following a disappointing full debut at Newport County. Finally, Caolan Lavery was presented with a maiden Pompey start following two substitute outings, replacing Matt Tubbs as the only striker. Their impact ensured the hosts began positively before once again the match petered out into an attack versus defence encounter in the attempts to force a breakthrough. Mansfield had named Craig Westcarr in their starting line-up, a figure who struggled to convince Blues followers during his season on the south coast last term. Yet such was his team’s requirement to defend, he contributed little and was substituted on 62 minutes to ironic cheers from the supporters of his former club. Led by the combative defensive figure of Lee Collins, the wall which rose up in front of every attempted entrance into the penalty box proved indestructible. Cook even switched to 4-4-2 on 59 minutes – much to the delight of those who demand the tried-and-trusted system should replace the 4-2-3-1. There is a steadfast belief among some that a two strikers should be leading a Blues attack on home soil. Chaplin and Nigel Atangana entered from the bench in place of Naismith and Rommy Boco, Chaplin’s arrival in particular lifting the crowd. 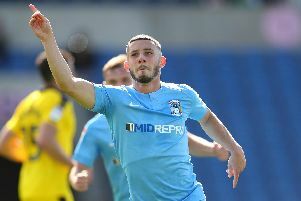 The five-goal youngster is a popular figure at Fratton Park and his presence at this moment in his career is as influential on the pitch as it is off it. In turn, Cook’s men stepped up the pressure as they swamped the opponents’ half in the hunt to break the deadlock in front of the Fratton end. Davies had his attempt, Chaplin had his, yet that was it, the sum of the parts. And so the stuttering home form continues, contrasting so alarmingly with their continued success on the road. Perhaps if the results were reversed – with the away record occurring at home – it would be more palatable to fans. Certainly second spot a third of a way through the season should be toasted by supporters desperate to escape. Yet any such fine progress is being clouded by more Fratton frustration.